One evening I fell deep down into an Instagram rabbit-hole, and stumbled upon this pattern. I think it was this image that originally caught my eye – a beautifully simple version in black by @ahappystitch, but seriously, I think every version that I’ve seen is beautiful! 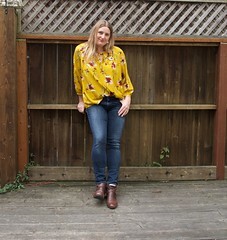 I haven’t seen this pattern floating around the blogosphere much, so I am here to give it some blog-o-love! 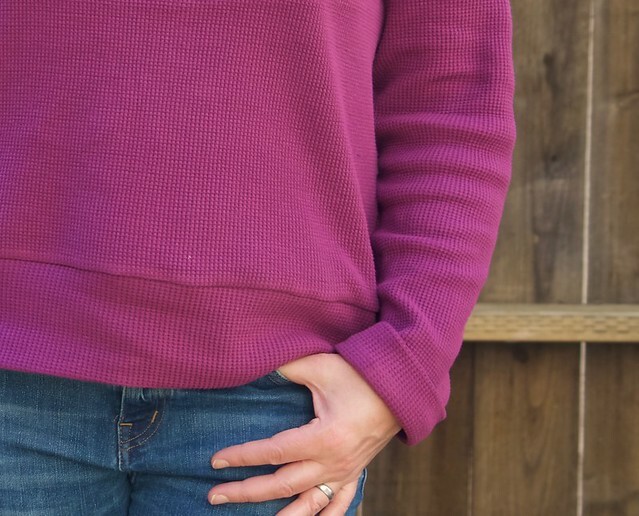 I poked around in my fabric stash, and came out with this bright and lovely organic cotton interlock – a nice pop of color so perfect for spring! 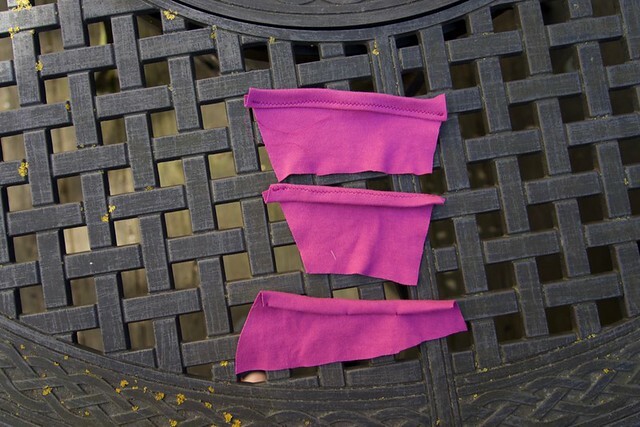 I printed and traced my pattern, cut my fabric, and sewed up my top lickety-split! 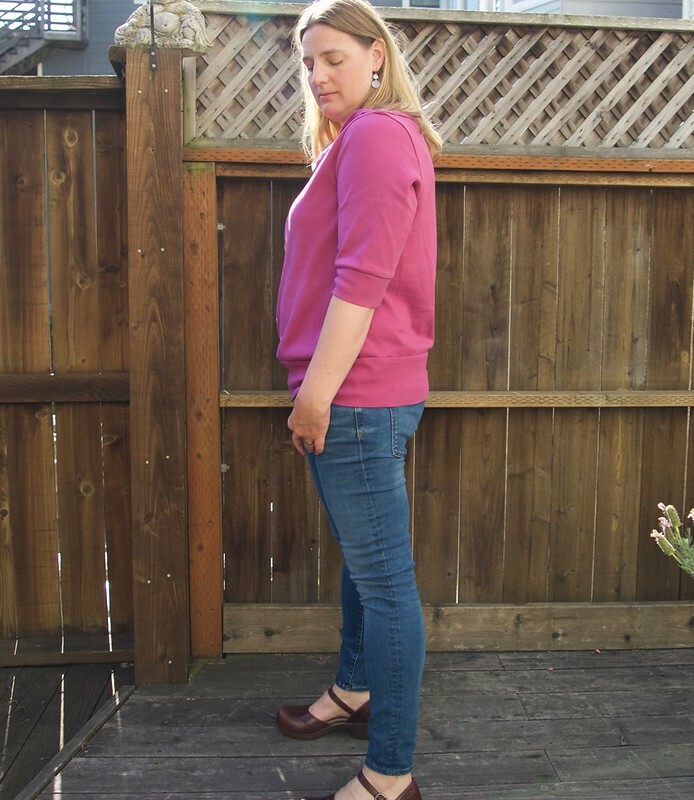 Such an easy construction – and no hemming required. I made a straight view A, with only minor modifications, namely cutting the sleeves at the longer view B length, then adding the bands, which essentially lengthens the sleeves by about 3 inches. The pattern includes 5/8 inch seam allowances, so I also lengthened the body by 1/2 inch by simply sewing the bottom band on with a 3/8 inch seam allowance instead. I must profess my love for this fabric – it is an organic cotton interlock from Organic Cotton Plus, which comes in some great colors. I’ve used this fabric in black, heather grey, and dark blue to make comfy pants for my son, which are a great hit. 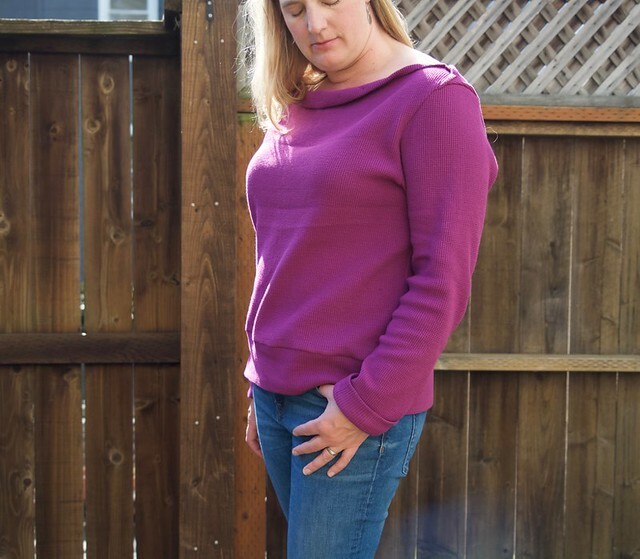 The fabric is heavier than a jersey, and heavier than other cotton interlocks on the market (such as the Birch Organics ones), making it perfect for a lighter-weight pair of sweatpants or sweater. It has good stretch and pretty good recovery, but is 100% cotton, and super soft and smooth. 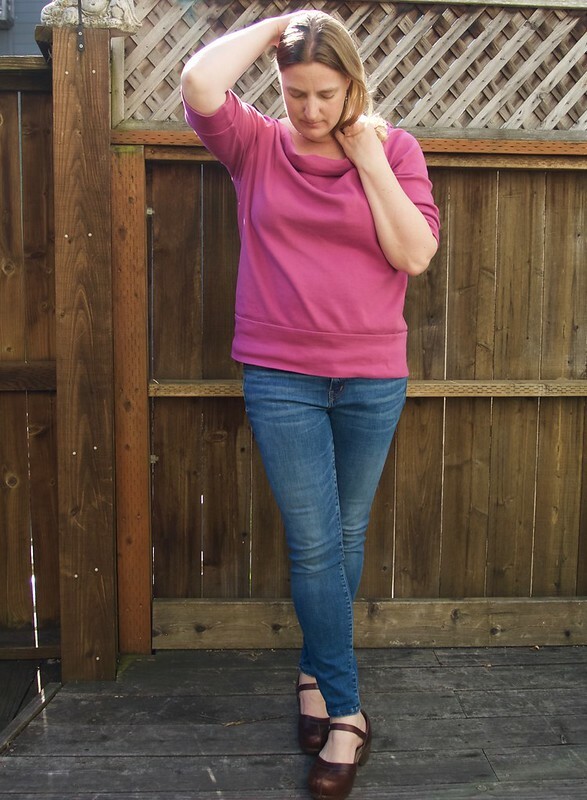 The only problem I had was that the edges just don’t roll as they do for many other knits, and the Anegada pattern is designed to have a raw rolled edge at the neckline. I tried simply folding the edge over twice and pressing it, which worked until I washed it. After washing, the neckline came unrolled and became awkwardly creased. 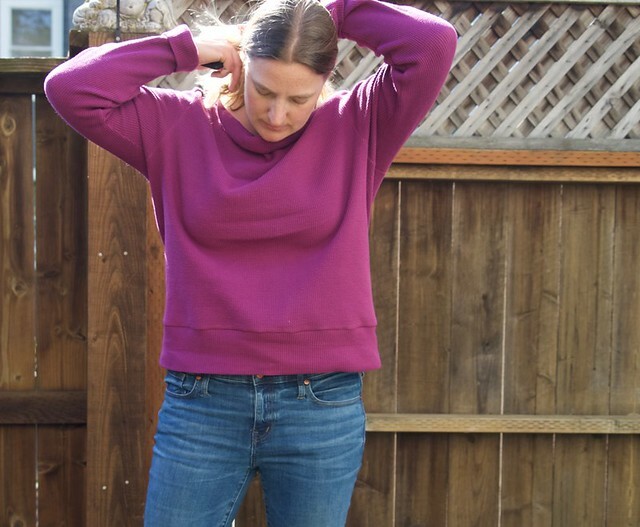 I experimented with a couple of different methods of finishing the neckline on a scrap of fabric (after the garment had been constructed, worn, and washed several times, mind you)! I decided that I wanted to keep the softer look of the rolled edge, so I chose to tack it down every 2 inches with a few narrow zig-zag stitches. With matching thread, it really blends in nicely and looks intentional. 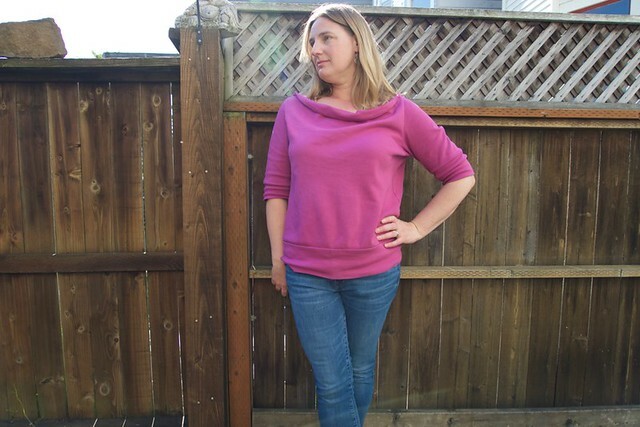 This time I lengthened the sleeves to make a long-sleeved sweater. 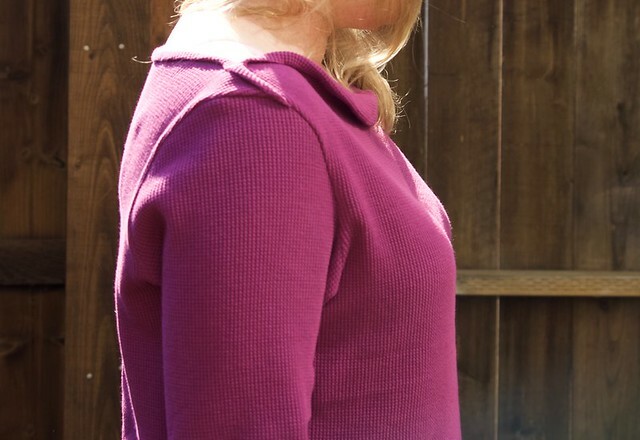 This fabric is a thermal knit, just a shade darker than the plum-colored interlock, and also from Organic Cotton Plus. I ordered this (along with some of the blueberry color) after admiring the saturated colors online for months. I thought that I would make myself a tight fitting thermal top for winter (maybe a Lane Raglan), but I didn’t realize how thick this fabric was. 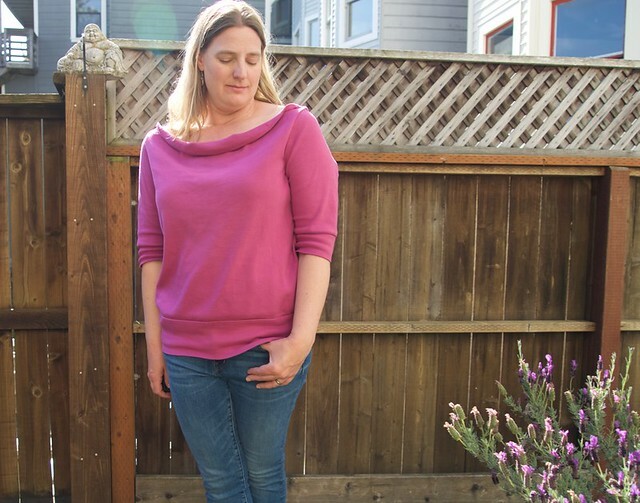 It is too thick for a base layer – California winters just aren’t that cold! But it makes a beautiful sweater! 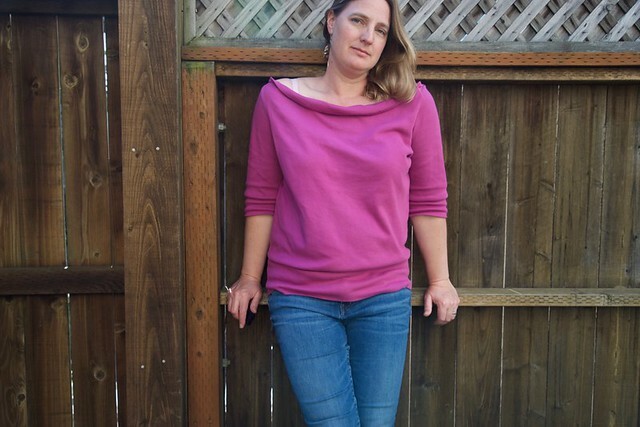 I cut out the same size as my first version, but the thermal knit wears very differently – perhaps the interlock just has much better recovery, while the thermal grows with wear, so that the top ended up much bigger on me than my first version. I took an extra 1/2 to 1 inch or so out of the sides and trimmed 2 inches(!) from the bottom. The result is still plenty roomy, and I enjoy snuggling in this slightly oversized sweater! So comfy! I’ve already worn this over a tee shirt (and under a jacket) for The Boy’s soccer practice during our cool (foggy! windy!) San Francisco evenings. The neckline is quite wide for both tops, so I usually layer them over a tank top or tee for work. Although I like them on their own too for more casual wear (as shown in these pictures). 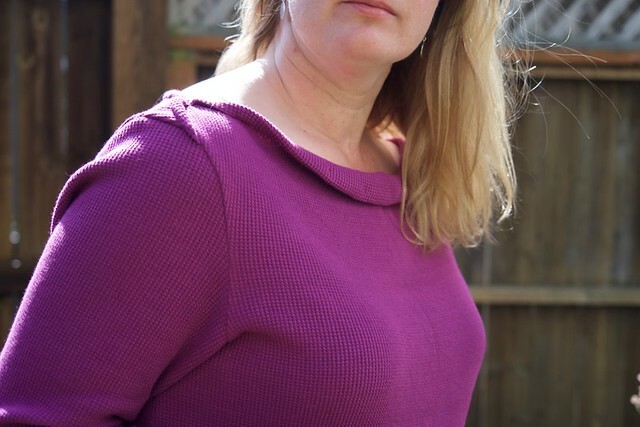 The neckline is tacked down in the same way for this version (and almost impossible to see in these pics). I just love the texture of this fabric – gives it such character. So go on, buy this pattern! You’ll look amazing in it! That color is gorgeous on you! Great job. 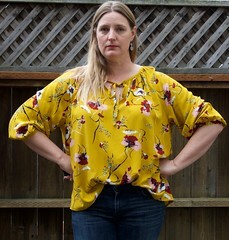 The softly rolled neckline is perfect on this top.